We are all well. I will ans. your welcome letter after Xmas. John is at the A.M. College. They have a big job there he will be home Xmas. Hoping you a Merry Xmas. 1) It can be confusing when there are multiple people in the same family with the same name. However, there is no question who this postcard comes from. It wasn't written by my grandmother, Myrtle. She would never address her mother as, "Maggie," and she wasn't living in Austin, Texas in 1921. This comes from my great grandfather's sister, Myrtle (Van Every) Carleston. I'm fairly certain my grandmother was her namesake. 2) I don't think it's unusual for the times, but it does seem strange that nowhere on the postcard does Myrtle mention her brother. 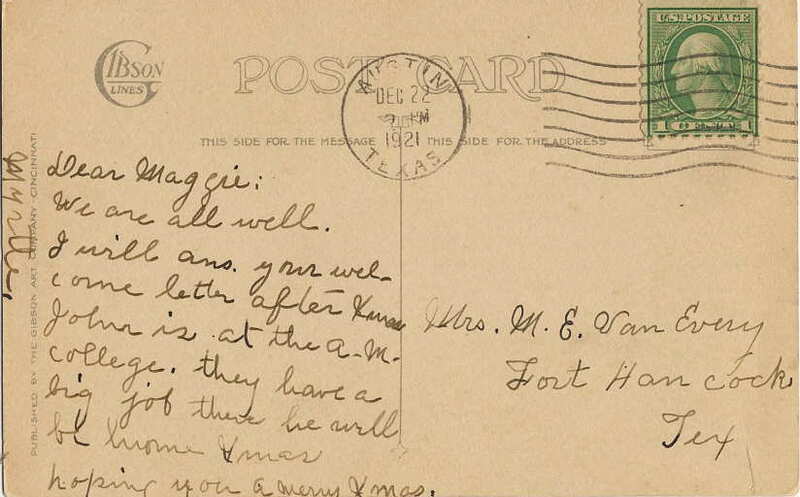 The postcard is addressed and written solely to her sister-in-law. I guess the 'you' in the final sentence could be plural. 3) "John" mentioned in the postcard is Myrtle's husband, John Carleston. 4) My great grandparents had moved from the Maxwell/San Marcos area to Fort Hancock/El Paso in 1917.